What led to the founding of the Sunshine Learning Difficulties Centre? 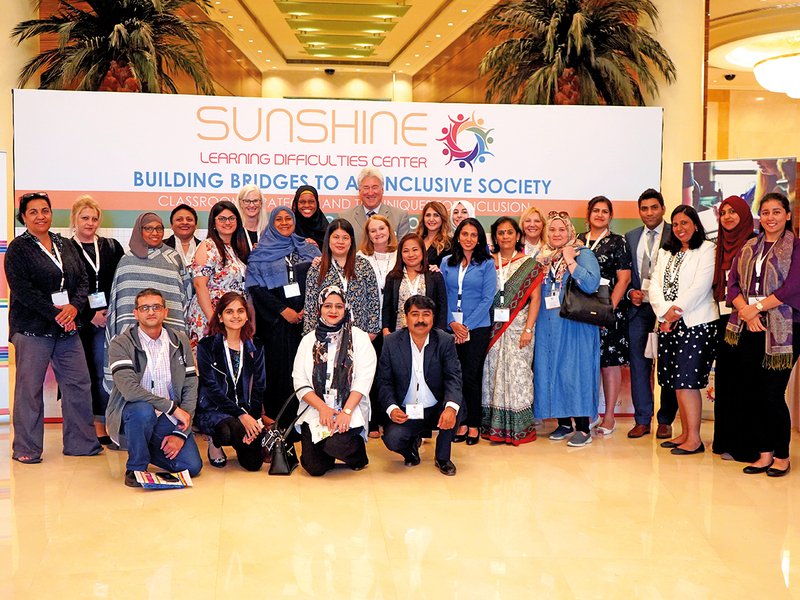 Sunshine was set up through an initiative to provide special education services that were licensed with community development authorities in Dubai. I was the fourth person to be licensed as a special educator with the Community Development Authority and the first American. Through this licence, Sunshine was the first centre opened specifically for special education services in the UAE. Sunshine will promote that Dubai becomes a friendly city for people of determination by 2020, an initiative of Shaikh Hamdan Bin Mohammad Bin Rashid Al Maktoum, Crown Prince of Dubai. What does special education consultancy entail? Special education services are those that cater to people who have disabilities, or gifted and talented ones who need intervention with the right programmes in order to succeed. We provide services involving special education, counselling, educational assessments, and most importantly the individual education programme process — to schools, parents, individuals, and those within the community requiring our services. There’s a couple of categories that we cater to, while looking at the kind of services they require according to age groups starting from early childhood up to five years old and those between the ages of six to 18 years. Special educators are unique in what they do. To know if you have the right educator make sure he/she is licensed with the Community Development Authority because there’s only a handful of us here. Any one doing special education services must have a proper licence. I’ve come across instances wherein people who have just attended some seminar on special education feel that they are equipped to handle this area, but this is not fair to the students. It needs correct training, expertise and experience. What services do the center offer? We offer special education counselling where we understand what services are needed. What is key is special education is a service and not a place so services can be carried out in a variety of settings. We do education assessments to find out the student’s present level of academic achievement and functional performance. With that information and a report from a qualified psychologist we get an idea of what kind of disability the student has and create special education programmes. We also provide advocacy and school placement. There is a Federal Law No. 29 of 2006 to protect the rights of people with special educational needs. Making sure that those rights are protected is one thing that special educators do. We offer school placement service, wherein if a student has a special education need or SEND (Special Education Need and Disability), he/she needs services through school. It’s often difficult to find the right school because a lot of times children are rejected because the school can’t provide for them. In such cases we get the profile from parents and go to the concerned school to provide support to the child. We also provide the Individualised Education Programme (IEP), a written education plan designed to meet a child’s learning needs. A programme called CLASS, brand new to the UAE, is available here through Sunshine and helps educators in schools to write effective IEPs. We understand that kids need support other than just academics. With IEP and the CLASS programme we integrate the goals of related service providers such as a speech therapist, occupational therapist, and a behavioural therapist. We hold a professional training development license with KHDA to offer classes to educate and professionally develop teachers and people dealing with people of determination, and gifted and talented students. We design policies for schools, taking into consideration what is expected by the KHDA and the Ministry of Education. We work with a multidisciplinary team to do KHDA inspection preparation in special education to prepare the school for the standards required. We are listed with Sanad, a card for people with determination under the Community Development Authority, as a service provider to offer initial consultation. Talk us through the recent event organised by you. We recently had a two-day conference called Building Bridges to an Inclusive Society: Classroom Strategies and Techniques for Inclusion’ where we had people from the division of international special education services come to Dubai to go through strategies and techniques required for inclusion for students in classrooms. It was to help teachers realise the things they may need to do in the classroom for students right from behavioural techniques to writing IEPs. It was a great success and we had very good feedback. How is the Centre providing support to students in schools catering for inclusion? Inclusion is a nice philosophy, but people are not keen to know exactly how that can happen. The dynamics of Sunshine special education services is that we provide real solutions to sum up the things that may be needed inside a school. Sometimes a school may not have a special educator so we provide services till they find one to keep things going as students need consistency. We also provide educational testing for children that parents can provide to the school and the school is able to utilise that and guide the student accordingly.